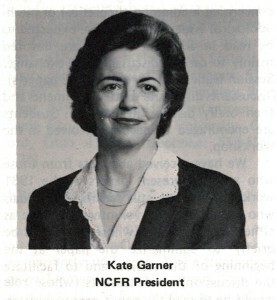 ¶ 1 Leave a comment on paragraph 1 0 Kate B. Garner became NCFR’s 38th President. Her special interest was the development and growth of the Affiliated Councils. She was for many years the executive director of the Family Life Council of greater Greensboro, North Carolina. ¶ 3 Leave a comment on paragraph 3 0 If a magic wand could be waved for only one wish to be granted for NCFR, it should not be for increased membership, nor dollars, nor modern headquarters, nor for many of the other improvements we aspire to, much as they are essential. It should be, instead, for all our members to build and maintain an active network through the affiliates. Through the “ripple effect,” our influence would increase exponentially to a large population . . . Whether we can succeed depends on agreement of purpose and the constancy in which we adhere to it.